Sure to enhance any interior, the Ferrero Brushed Steel Bar Stool Brown is not to be missed. 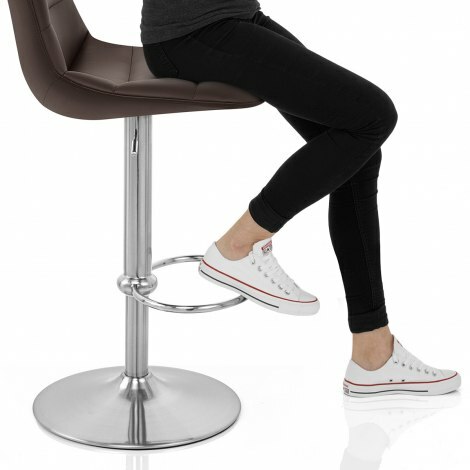 A sumptuous and supportive piece of furniture with a classic colour scheme, the Ferrero Bar Stool is a wonderful model that will update your bar area in an instant. Upholstered in beautiful brown faux leather, the comfortably cushioned seat is inlaid with trendy horizontal stitching that lends its generous shape and high backrest a fashionable flair. Set on a robust central column frame with a chic brushed steel finish, a stylishly sculpted footrest provides a practical perch for the feet. Plus there is a gas lift mechanism for adjustable height and 360 swivel, allowing optimum mobility and ease of use. Completed by a protective underside to help minimise damage to floors, the Ferrero is an inviting design that will leave you wanting more. "Superb stool! Comfortable & Classy"
Great well made product that is really comfortable! Excellent service & next day delivery as promised. So much choice it was hard to decide which kitchen stools to go for. But these are perfect, with a nice high back for support whilst still looking great. Delivered the next day and within the 1hr time slot. Thank you Atlantic...we will definitely recommend you.